Gorgeous lace and tulle ball gown dress 42034 from Morilee is a romantic choice for your special occasion. 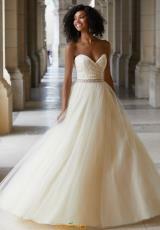 Showcasing a lace ruched bodice with a strapless sweetheart neckline. An accentuating waistline is adorned with sparkling silver stones and is followed with a full tulle a line skirt that will make you feel like a princess.